Canadians consumed 153.1 million kg (Mkg) of turkey in the year 2017. Per capita turkey consumption in 2017 was 4.2 kg. An estimated 57.6 Mkg of turkey and turkey products were purchased at retail by Canadians in 2017. Of that 57.6 Mkg, 43.2 Mkg of whole turkeys were purchased. In 2017, Canadian households consumed a total of 7.2 million whole turkeys. Annual sales of turkey parts and processed turkey products in Canadian supermarkets increased from 8.8 Mkg in 1993, to 14.0 Mkg in 2017. At Thanksgiving 2017, 2.2 million whole turkeys were purchased by Canadians, equal to 31% of all whole turkeys that were sold over the year. 29% of all Canadian households (4.2 million) purchased turkey and turkey products for Thanksgiving 2017. At Christmas 2017, 3.3 million whole turkeys were purchased by Canadians, equal to 47% of all whole turkeys that were sold over the year. 36% of Canadian households (5.1 million) purchased turkey and turkey products for Christmas 2017. 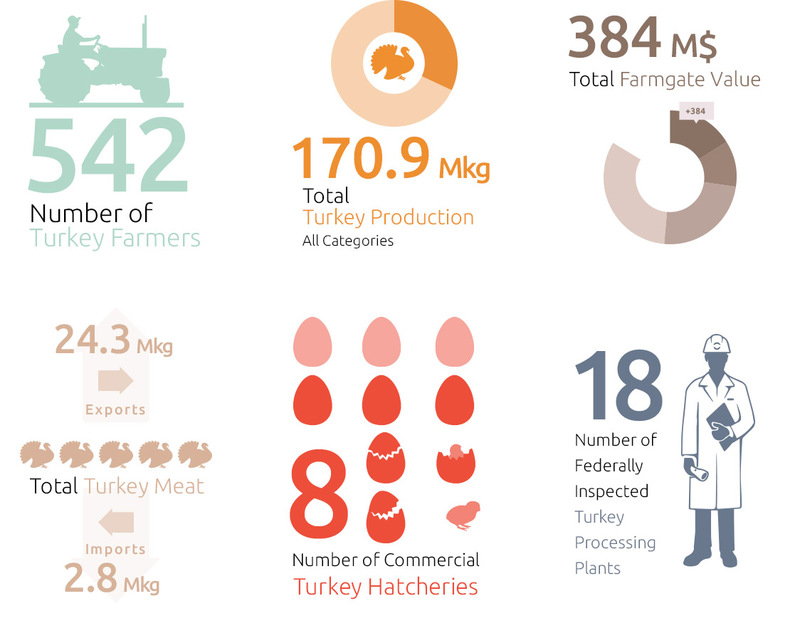 A statistical history of the Canadian turkey industry, with select information on competing meats and international markets.